On today’s show I talk with Susan Eng, Vice President of Advocacy at CARP, an organization focused on helping seniors and future generations with issues like financial security. Susan explains that studies like our Joe Debtor study on seniors and bankruptcy, catalogue the fears that seniors have today; fears about outliving their savings and their children’s and grandchildren’s lack of economic opportunities. During our talk, she describes the need for government reform and options for reducing senior debt levels. Susan explains that for senior poverty levels to improve, there are things that the government can change both on a short-term and long-term level. In the short-term, things like affordable access to medication, housing and income will improve the lives of Canadian seniors. In the longer term, pension plan reform and savings opportunities will help future generations as they age. our poverty rate among people 65 and older, according to Stats Can – using the low income measure – is 12%; meaning 600,000 people in Canada today who are age 65 and older are living in poverty. a lot of times it’s the unexpected that really catches them. the general stereotype is that once you’re a senior, you stop living. You stop buying, you stop buying new houses, you stop getting a divorce. You just carry on wherever you were at, at 65; you just basically go into a static future. While it may have been true that many years ago seniors retired without debt and limited their borrowing habits, today’s seniors are starting new relationships, getting divorced, starting businesses and new jobs – and they take on debt to do it. Once you hit 65, time and your finances don’t just freeze. With low interest rates and the ability to invest to try to fill an income gap, the opportunity to borrow money isn’t isolated to young Canadians. One shocking finding from our Joe Debtor study was that the highest total dollar value owed on payday loans at the time of filing insolvency, was owed by seniors. Susan explains that one reason seniors are turning to alternative lenders is that banks will not offer traditional loans to those already in debt, with limited income streams and assets that they stand to lose. One solution that we discuss is to bring back micro-credit as a way to offer smaller loans to individuals who might not qualify for traditional larger loans. Moreover, Susan asserts that low interest rates are making seniors vulnerable to financial problems because their money is not earning anything sitting in the bank. To combat this, seniors are turning to alternative lenders and riskier investment options to try to maximize their earning potential or to supplement their fixed income; often leading to negative results. Instead, Susan suggests that the government create opportunities for savings such as increasing CPP and making medications, home care and housing more affordable for seniors. The take-away message is that we need to start planning for retirement early. Being proactive about dealing with debt as soon as possible and growing your savings to ensure that you won’t outlive your cash flow is essential. While organizations like CARP are working to create change throughout Canada, it’s important to assess your own financial future so that you can make a plan early to avoid taking on debt that you can’t pay back, once you retire. The impact that health-related issues can have on an individual’s finances. CARP’s lobbying successes and why elections are opportunities for change. Doug Hoyes: Seniors in financial trouble have more debt than any other age group and some seniors are borrowing just to survive. So, what’s the solution? What can we do to help seniors? Is there anyone out there focused on helping seniors? Yes, there is. In fact there’s an organization that is advocating for a new vision of aging in Canada. And one of their goals is to bring about financial security for all Canadians. I traveled to Toronto to speak to their Vice President of Advocacy and here’s my conversation. So, let’s get started. Who are you and what do you do? Susan Eng: My name is Susan Eng; I’m in charge of advocacy for CARP. Doug Hoyes: So, tell me about CARP, what is CARP? Susan Eng: Canadian Association of Retired Persons, but we don’t use the full legal name anymore because so many of our members can’t afford to retire. And indeed the issues that we cover really appeal to all age groups and these are issues that we can fix and improve for all Canadians as we age. Doug Hoyes: What are the big issues then that you are seeing right now. I know in our world we’ve done a study looking at the debt that is held by people who end up having to go bankrupt or file a consumer proposal. And the fastest growing segment is seniors. Is that the sort of thing you’re seeing as well? Susan Eng: Absolutely. In fact, what you’re doing is finding the evidence for what our people are worried about. You are actually cataloging the very fears that they have; the fear of outliving your money. And so, for a lot of our members, and people like them, they worry first of all whether they themselves are going to outlive their money, and they see that despite their own savings, and even many of them have workplace pensions, they see that their kids and grandkids are not having even the economic opportunities that they did, and certainly don’t have any savings. And so, the concerns that they see, the fears, the results that you’re cataloging are basically in evidence the kind of fears that they have. And so obviously our advocacy at CARP is to try to get ahead of that game, to help people save better. If we’re going to look for pension reform, that’s not going to be for our members, that’s going to be for their children and for their grandchildren. Doug Hoyes: And that’s a significant fear. I believe I’ve heard you say, and tell me if I’m misquoting you here or not, but the root cause of poverty is a lack of money. So, I mean so okay if that’s true, what do we do to solve that then? Is it some of those things that you just mentioned? Susan Eng: Well you have to decide whether you’re talking long-term or as you slice into the circle right now. For people who are today, living in poverty and can’t make ends meet, there are much more important things we have to do, which is to make sure that they can afford to keep moving forward. So, they have to be able to afford needed drugs for example. They need affordable housing, they need to have better incomes supplementation including an increase to things like the GIS, which can happen in the short-term. Over the longer term as a generation, what we have seen over the last couple of decades is indeed seniors poverty has reduced from double digits over the last 20 years and largely on account of the maturing of the Canada Pension Plan. But the impact of that improvement has now matured. And that means that unless we do something more, future generations will see those poverty rates increase. Indeed today, our poverty rate among people age 65 and older, according to Stats Can using the low income measure, is 12%, meaning 600,000 people in Canada today, who are age 65 and older are living in poverty. Doug Hoyes: So, you think 12%, that doesn’t sound like a very big number, but when you multiple it by the number of people out there you’re right, 600,000 people. Susan Eng: It’s a lot of people. And different from people who are younger, these people have far fewer opportunities to get them out of that situation. A younger person can maybe take a new course, get a new job, have time to work this through. An older person who has just lost their job for example, has very little savings, maybe a health problem on top of that, is going to have a great deal of difficulty changing those circumstances. Changing indeed the trajectory of where the finance are going. So, for those people we need immediate support to reduce their expenses, increase their income. Over the longer term you don’t want to see this happening. That’s why we have a focus on for the very longer term, an improvement in supplementary pension plans, cause frankly although you could say that you are indeed a financial genius and you can make money on your own, in fact the vast majority of us are not that good. We are better off in a larger, you know, collective pension plan. In the midterm for people who have a bit of savings, the work we do is to help them keep a few more of their dollars, help them manage their money better, give them savings opportunities, hence the changes in the last budget. Doug Hoyes: So, you hit on a number of different issues there. So, let me give you my perspective and tell me if I’m off base or not. So, when we did our study we found that yes, in fact, there are a significant number of seniors who have significant debt problems. But obviously, our study doesn’t cover the people who didn’t go bankrupt and file a proposal. I assume there are a significant number of seniors who are doing fantastic cause I’ve got a company pension, I didn’t get laid off, I worked at the same company forever, I’ve got a paid for house, I didn’t get downsized, I didn’t have those things you said happen; divorce, the sickness and whatnot. Is that true? Are there two different separate populations of seniors? Susan Eng: Well indeed the population of seniors is not homogeneous, it is heterogeneous and it is – you will have people who are wealthy. But we’re an advocacy organization and we concentrate on the people who need our help. And that is not only the very poor, but also the people of being at risk of not being able to have enough to carry on. And a lot of times it’s the unexpected that really catches them, they lose a job, they have a divorce, they have a medical incident. Those are the primary drivers that take a modest life and possibly drive it into poverty. Doug Hoyes: That’s the first part of my conversation with Susan Eng, the Vice President of Advocacy for CARP. You just heard Susan Eng say that seniors are like every other age group. They live their lives and it’s the unexpected events like job loss, medical issues or divorce that can take a modest life and possibly drive it into poverty. So, how does debt factor into this equation? That’s my next question for Susan and you’ll hear her answer right after this break. We’ll be right back here on Debt Free in 30. Doug Hoyes: Before the break my guest, Susan Eng of CARP, told me that unexpected events like medical issues or divorce can cause serious financial problems. But why is that? Shouldn’t seniors be insulated from debt? Don’t seniors stop spending once they retire? No. And here’s Ms. Eng’s explanation as to why that stereotype is wrong. Susan Eng: The general stereotype is that once you’re a senior, you stop living. You stop buying, you stop buying new houses, you stop getting a divorce. You just carry on wherever you were at, at age 65 you just basically go into a static future. No. People today as they enter these ages are doing just whatever they were doing; new relationships, new businesses, new jobs, whatever. And they take up debt to do so. It used to be so that many people as they see themselves coming out of the workforce will not take on debt. They figure this is it. I’m just going to keep my pennies and not take any risk. But that’s not today’s senior. Doug Hoyes: So, seniors keep on living. Am I quoting you correctly? Doug Hoyes: And keeping on living, one of those things means continuing to borrow in some cases. Susan Eng: Yes, cause right now, first with the low interest rates, people are borrowing for a number of reasons. Obviously, they need the money to do the things that they – to meet their daily needs, but also an opportunity to invest and make up some of that gap, that savings gap that they have. So, there are a lot of reasons why people are taking up debt and when they do and then something bad happens, they’re going to be coming to you. Doug Hoyes: Yep. And so do you, and I’m asking you a generic question here, which obviously you can’t answer but, in general are you recommending that seniors should be borrowing to invest to catch up? Or do you think that’s something that in general is dangerous, there’s better ways to solve the problem? Susan Eng: No exact rule of thumb other than be extremely careful and seek a good financial advisor, who takes into consideration your life circumstances. That’s another one of our advocacy issues and that is dealing with financial advisors who give inappropriate advice to older Canadians. And part of the problem has been that, you know, on one hand you have very good advisors, but they’re not all very good. And the ones who have to pay their own mortgage might be putting the senior investor in something they ought not to be. It’s more risky than they can afford to sustain. And so, those are cautions. Doug Hoyes: One of CARP’s roles is to caution seniors about issues like less than reputable investment advisors. An even bigger area of their advocacy work is lobbying the government to make changes that benefit seniors and their families. I asked Susan Eng to give me CARP’s list of requests for this year’s federal election and here’s what she said. Susan Eng: Here we are in the new election cycle, and we are making more demands again on behalf of all older Canadians indeed, and all those who love them. You know when we talk about pension reform we’re saying older voters, who do all the voting practically, care about this not for themselves but for their children. So, increase the CPP. We worry about the people now who have trouble making ends meet so we say increase the OAS, especially for single seniors who have higher rates, double digit rates, of poverty, so on the money side of things, that’s what we’re focusing on. On the other side healthcare is another major issue. The most significant issue for all of our members and some 50 seniors groups that we brought in together under the collaboration called Senior’s Vote, was the focus around pharma care. You can imagine, despite the fact that most provinces cover many drugs – many needed drugs – for seniors, there remains huge gaps, huge discrepancies and massive costs. Even the co-pays are burdensome for many families where people are choosing not to buy, not to fill their prescriptions with the net result that their medical condition gets worse or they cause themselves a problem that takes them to the emergency room. So, that is a critical challenge for us. All the parties have mentioned it and so we’re in a position now where that issue will likely become a major election issue. Doug Hoyes: Is that more a federal or a provincial issue or both? Susan Eng: Well see here’s the thing, technically, very technically speaking, healthcare is provincial jurisdiction. The federal government, as employer and responsible for the Armed Forces and First Nations, also purchases drugs for coverage for these populations, so, it is as big a drug buyer as the Ontario government for example. So, they need to be at the table to be part of the collective that’s going to make the necessary changes, the fundamental changes that will allow all Canadians to have access to needed medications regardless of their postal code and regardless of their pocket book. That’s the aim of pharma care. Doug Hoyes: Now seniors vote. I assume that seniors as a percentage vote more than any other age group. Susan Eng: Without exception. Elections Canada tells us that people at the age of 60, indeed over 70, nearly 60 to 70% turn out. Doug Hoyes: 60 to 70% turnout. Susan Eng: Of eligible voters turn out to vote. Susan Eng: Compare that, it’s almost in line with their age group. So, those who are 30 and under, less than 30% of eligible voters turn out to vote. So, given that we have low voter turnout overall, who do you think has the weight of the ballet box? Doug Hoyes: It’s the seniors. So, 50 year olds are 50% likely to vote. Doug Hoyes: We’re obviously doing rough numbers. So, it is a very important thing. Because if I’m a politician these are the people who are actually going to show up and vote, they’re the ones who are going to elect me. So, I’ve got to listen to them. Susan Eng: And what is more, one of the mandates we gave ourselves at CARP was to unpack the larger issues and make it clear to our members at least, and others who are listening, what the issues are, how the parties are responding to the issues and what difference it would make if you were to vote for this proposal over that proposal. So then, it becomes quite clear. And where there has been a stereotype that older voters are loyal voters, they always vote what they’ve always voted, the party or the candidate, in fact, that’s not true. Our poling shows that our members are prepared to vote the issues. Doug Hoyes: And so you, I’m putting words in your mouth here, but you don’t really care who wins the election, so long as they are going to support the policies that your members have based on your poling and advocacy efforts are asking for. Susan Eng: Well absolutely. Our members run the gamut of political stripes, but the fundamental here is that there really is only one tax payer, one patient, on citizen. And they, each of them need certain things that will help them thrive in the next 25 years of their life. Doug Hoyes: So, one more issue I want to hit on before our time is up is back to the area of debt. And I think you’ve given us a very good picture of why it is that seniors can get into those problems. And I think our studies have corroborated exactly what you’ve said. One of the most amazing things I saw in our studies is that the highest payday loan balances is held by seniors. They’re not the biggest consumer of them, younger people will have perhaps more of them, use them more often. But the total dollar value owed at the time of filing a bankruptcy or consumer proposal is highest amongst the seniors. Which blows me away because well a payday loan you would think is a – I’m borrowing against my next paycheque, if I don’t have a paycheque because I’m retired why am I getting a payday loan? What’s the replacement for it? Is this something banks should be looking at? What’s the answer? Susan Eng: You’ve put your finger right on the answer. Getting that answer out is going to be our challenge and that is this: that banks, as you know, when they are choosing whether or not to give you a loan, look at a number of factors including your income stream and whatever assets you have; hence the popularity of reverse mortgages, which are not for everyone and can cause great harm to the family. Cause now including being in debt, they may also lose their house. But the problem is, the banks are not giving them the loans. So, unless and until the banks open up the vaults a little bit, let in people who are in the circumstance of those people who are getting payday loans, we are going to continue to have this problem. Because what are their options? It’s either the credit care or the payday loan. The bank is not stepping up. And I think they should. Doug Hoyes: So, if I put you in charge of the biggest bank tomorrow, which I don’t actually have the power to do. We’re having a hypothetical discussion here. But let’s just assume I did. Then would you be having some kind of small loan product? Susan Eng: Absolutely. You know we think up these great ideas for other people’s countries, right? You know micro-credit? Well, we could use it right here in River City. Doug Hoyes: And micro-credit is very small loans. Susan Eng: Yes. Very small loans that depend on something that seniors are good at, repaying them, right? The importance of micro-credit was that you have sort of a community of interest, that if you don’t repay somebody else in your community of interest is going to be hurt. When you think it’s going to be the bank that’s going to get hurt. Susan Eng: Many people refrain. But if you have – if you create a micro-credit environment in which there is that community of interest, indeed could the bank be your friend again? Could your – could there be a local bank manager again? Could there be a local bank branch again? Let’s try that one again. And if there were, would we have the opportunity to keep people helping them with their financial needs as they go through their challenges and not have them have to declare bankruptcy. These are the people heavily motivated to repay. But if they have no other choice, that’s where they start coming to you. Doug Hoyes: And you’re absolutely right. I’m the last resort when they come and talk to me. And most seniors I’ve dealt with obviously don’t want to be sitting in front of me, but they have no other choice. How much have low interest rates hurt seniors? Susan Eng: Well, for those who had a few dollars saved up, it hurts them a lot because they’re making no money. There was a time when we had double digit interest rates and some retirees thought they were geniuses, but they were just clipping coupons and they had enough to live on just off the interest. Now you have to dig into capital just to get by. So, it is a huge problem for them. Doug Hoyes: And it’s not just that interest rates are low, but real interest rates are low. And you look back 15 years, 20 years, 30 years we always had historical real interest rates. So, the interest rate, minus inflation, in that sort of 3% range. Susan Eng: Now they’re negative. Doug Hoyes: Now they’re negative. So, if I’m a senior and I did everything right, I saved money my entire life, I’ve now got a nest egg, I don’t have any debt, I put the money away, that money in the bank is actually losing money. Susan Eng: That’s right, it’s not growing, losing money, and you can’t draw it down without basically making yourself financially vulnerable. Doug Hoyes: And so, my only choice, then, is well I guess I better invest in riskier things. I better go into the stock market or bonds or something I perhaps don’t fully understand. And that’s got to lead to problems. Susan Eng: It does, it absolutely does. And so, there’s no single silver bullet. It does mean that we have to look at the whole person, all of the challenges. If you start off with a bit of savings, first of all, good for you. But let’s find out a way to grow that money, to help you with your retirement needs. And even borrow against future investment income, which is difficult to imagine. But we have to find a way to grow that kitty so that will cover your needs. In the meantime, as a matter of public policy, let’s make sure those needs are not so overwhelming; the cost of drugs, the cost of housing, the cost of home-care, nursing home even. Doug Hoyes: And there’s nothing we can think of right off the top of our heads to solve the interest rate problem. So, your role then is let’s deal with the problems we think we can solve. Doug Hoyes: Excellent. Well, I think that’s a great way to end it. I really appreciate you joining me today, Susan. Doug Hoyes: It’s time for the Let’s Get Started segment here on Debt Free in 30. 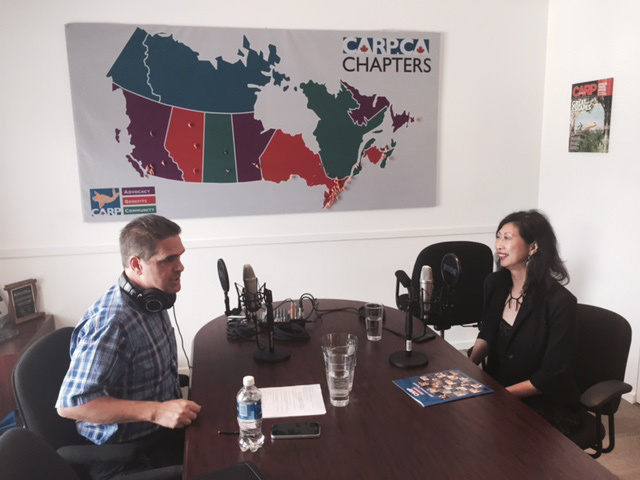 My guest today is Susan Eng of CARP and today we discussed issues that impact seniors. One of the big issues for seniors is healthcare, and so, I started this segment by asking about the cost of healthcare. Here’s our discussion. Doug Hoyes: Let’s talk briefly about healthcare. Healthcare in Canada is all free, right? Susan Eng: Well, you know, we think it is, but it’s not. And here’s the problem. We Canadians have the conceit that we’re so much better than the Americans cause nobody here would go bankrupt if they had a major illness. And in fact, it’s not entirely true. It is true if you had a heart attack they’ll patch you up and send you home. But if that means now you can’t work or your house is not suitable for you anymore and you need care and you can’t help your wife or whatever, then suddenly it becomes a financial problem too. And then that might lead to bankruptcy at the end. Doug Hoyes: Yeah, you’re exactly right. In the United States if I have a heart attack, I’ve got to pay the guy who’s going to cut me open and fix my heart and sew me back up. In Canada that’s like you say, free. Obviously, it’s not really free, we’re all paying for it, but I don’t have to pay for that directly. Doug Hoyes: So, that upfront cost is covered. But you’re right, it’s everything from there on out, you don’t recover from a heart attack in two days. Susan Eng: No. And Americans have gotten into the practice of having to pay for those healthcare events. And so, they may actually prepare themselves better. Whereas we think, oh everything is free so we don’t need to worry about that and we don’t set anything aside. Doug Hoyes: And so, the solution then is to be looking to the future at all times then I guess. Susan Eng: Well, it’s to first of all acknowledge that that’s a challenge that could happen to you. You know we may be perfect and we may be lucky, but those statistics didn’t come from nowhere. You could be the one hit by a car or fall down off the curb. And then you start a downward spiral that includes not only health issues, but of course financial issues. Doug Hoyes: Yeah and we certainly saw that in our numbers as well. A number of people who end up going bankrupt have – they actually cite, yeah health issues, medical issues and it wasn’t the issue itself, it was everything that flowed from it. So, if I had to be off work for six months or a year, how would my situation be? And if I’m older and I’m not working you might think, oh well you’ve had a heart attack, your pension’s going to keep coming. So, it’s no big deal, right? But I guess in real life it is a big deal. Susan Eng: It is. First of all because of the Canadian Pension and the Old Age Security is not enough to actually maintain your standard of living and pay for your drugs and pay for all these other expenses. So, it isn’t sufficient that you have this, but it’s better than not having it. Because those systems they were intentionally kept modest so private savings and investments would cover the rest. But if you don’t happen to have that additional money, you’re going to be stuck at the basic minimum, which at the end of the day basically takes you out of abject poverty into near poverty. Doug Hoyes: But it’s not covering every single expense you’re going to have. Doug Hoyes: So, it may not be or probably isn’t covering every single medication, it might not be covering that wheelchair you’re going to need, those other medical devices, the changes to your home, all those sorts of things. So, the solution then is you’ve got to be prepared yourself as well, otherwise, you end up having significant problems. Susan Eng: Right. And we do ask the government, the public system, to meet us in the middle; make it easier to get the care that we need, to supplement the home care that we would want. At least some guidance, a lot of people, family members step up, but they need to know what to do. We have a looming challenge in dementia care, which nobody seems to know what to do with. And we would be asking that the public system educate its front line workers as to how to deal with dementia cases. So, those are the kind of things where we have to be a partner with government to meet these challenges. Doug Hoyes: And I’m glad we’ve had this conversation cause I’m kind of in my head got this vision that well an organization who does advocacy work, lobbying if you want to call it that, I kind of think well a lobbyist means give me, give me, give me, give me, give me. And but you’re saying, yeah there’s things we want to put out there on the table, but you just said you want them to meet you half way. Susan Eng: Exactly so. And remember it’s the reality that our members and many Canadians really are very self-reliant. They’re not Darwinian about it, but they say look I can do most of this. But there’s a realistic appreciation that there’s some things you just need to do together, you need to do it collectively. That’s why we pay our taxes. So, that we expect that the roads are fixed, that the healthcare system works, that when we need to access these larger governmental programs, that they exist and work for us. Doug Hoyes: And then the government should stay out of our way in other areas, like that’s my retirement money that I’ve saved for and I should have more control on how to use it. Susan Eng: You’re absolutely right. Doug Hoyes: Great. Thank you very much, Susan. Doug Hoyes: That was my discussion about healthcare and seniors with Susan Eng. I agree with Susan’s point. Basic healthcare services in Canada are covered by the government, but many expenses like medication, home care and dementia care are not fully covered by the government. So, it’s important that we all look ahead to potential problems we can encounter and make a plan for our future. You don’t want to be incurring debt to do that. That’s the Let’s Get Started segment, I’ll be back right after this break to wrap it up here on Debt Free in 30. Doug Hoyes: For our 30 second recap, I’ll emphasize Susan Eng’s point that seniors keep on living even after retirement. So, it’s up to all of us to plan in advance and to help seniors during retirement. Full show notes are available on our website including links to Susan’s work at CARP. So, please go to our website at hoyes.com, that’s h-o-y-e-s.com for more information. Announcer: Thanks for listening to the radio broadcast segment of Debt Free in 30, where every week, your host, Doug Hoyes, talks to experts about debt, money and personal finance. Please stay tuned for the podcast only bonus content starting now on Debt Free in 30. Doug Hoyes: I had a great discussion with Susan Eng from CARP, and she gave me a great explanation of their previous lobbying successes. We ran out of time to air this during the radio portion of the show, but she had some very interesting comments on what CARP wants, and I was most interested in her perspective that CARP doesn’t just want lots of government money. Obviously, they want help for seniors, but they also want government to stay out of the way and allow seniors to manage their own affairs. It’s a delicate balancing act, so here’s more of my conversation with Susan Eng, explaining the successes CARP has had in the past, and why an election is CARP’s best friend. Susan Eng: A couple of really big things and then some subsidiary things. The one thing I will start off with is elections are my best friend. That’s when all of the parties are interested in hearing from us. When a government has a majority, they barely have to acknowledge your existence, frankly, and we got some really good successes in the last election round in 2011. Sorry for going back into ancient history, but it’s an example of how we can get things done. We had five major demands during that election. We said get moving on pension reform. Make sure you deal with elder abuse. We gave them that specific requirement to increase sentencing in the event of an elder abuse conviction. We said help the poor seniors by topping up their GIS. Get rid of the rule that says mandatory retirement. Let people work until they are not capable of not doing it anymore. Acknowledge care givers and give them some support. We got all five of those things after the election. Indeed all of the parties actually bid on how much more they were going to do for us around those issues. In the end, the Conservative government made those promises and kept all of them. Susan Eng: The most important thing was to have some changes to registered retirement income funds. As you know, people who have RRIFs are obliged to withdraw a fixed percentage of their assets each year and pay tax on it, whether they need the money or not. Doug Hoyes: Just so we are clear on this, when you’re working you contribute to an RSP. At a certain age you have to flip your RSP into a RIF. Doug Hoyes: A Registered Retired Income Fund. Under the old rules, what was the situation? Susan Eng: Well, the rules require you to withdraw a fixed amount each year, so the taxman gets his share right away, even though it may not be suitable for you at this time in order to draw out that money. Indeed, you lose the tax deferral room as well. Then you pay tax on that amount, you’ve got less to reinvest, and it really does make your own portfolio a little bit less sustainable. We argued that, let people manage their own money. They saved hard for this money, they need to be able to use it and take it out when they need it. Given how very low earnings rates are right now, the longer they leave it in the better they will be. And so, we argued that they should just get rid of those rules altogether. They listened to us, but instead of eliminating the rules they did reduce the percentage by which you have to withdraw your assets by 25%. So it’s significant, and it’s a big help for a lot of people to be able to leave their money in a tax deferred vehicle, until they need it. I think the key for us is to let people manage their own money. Similarly with TFSAs, Tax Free Savings Accounts, they were very very popular because they are flexible, and added tax deferral room when people are not working anymore; for example, retirees, people with lower income, because earnings are not taxed nor taken into consideration for any of the income support programs. So, that was an important doubling of the tax free savings room. Those were two major things. There was also a credit for allowing people to renovate their home in order to stay in it longer. This is something that we got from the Ontario government a couple of years back, and now it’s federal as well. These are important ways to reduce the expenses that you have to incur so that you can keep staying in your home despite medical challenges. Doug Hoyes: So it seems that you are an advocate of people taking care of themselves as much as they can. Doug Hoyes: It’s not like you are saying “government, give me money, give me money” you are saying my money is sitting there, let me use it the way I see best. Susan Eng: Absolutely. We profile our members using an online poll, and what we find from them is that we have a group of people who are first of all very resourceful. They pride themselves on being self reliant, but they are realistic enough to realize that there are some things that you cannot do by yourself. Just as you can’t build your own airport or your own roads, so can you not build your own pension plan as readily. So those are the kinds of things that our members support. So they support the collective action of a pension plan, for example. They do support saying, look you know, we are going to be looking after our loved ones so we are going to need a little bit of help here, you know, with some home care. We want to stay home as long as possible and not go into a nursing home, not go into a hospital, so I can renovate the house, put a ground floor washroom, for example, a few grab bars, and stay in my longer. Doug Hoyes: And that is probably better for society as a whole, in general, I would think. Susan Eng: Absolutely. First of all the sense of home, belonging, your social circle, it builds neighborhoods and the social glue. All of these things are important. As we get older these become more and more meaningful, and these are the things that can contribute to decline if you don’t have them. In large part these kinds of changes are really important. Another major gain in this latest budget was the extension of the employment insurance compassionate leave. Now, not many people know about this, nor would they, until they needed it. And that is, access to a small bit of benefit in the event that a loved one is in their terminal six months, and you have to take time away, you don’t have any salary; there’s employment insurance replacement of a small amount, a modest amount, but enough to help you over. That was limited to six weeks, and you had to have a terminal diagnosis. That got extended to 26 weeks, but you still have to have the terminal diagnosis, but we are asking them to remove that because there are many now chronic illnesses that require a lot of attention; they sort of go up and down in terms of acuity and people still need that income replacement. So that’s a next step, but that was a huge step, a huge acknowledgment of the need to support families who are looking after loved ones at home. Doug Hoyes: And again, that’s a two way street right, you are not just saying government, give me lots of money. You’re saying I’m willing to stay home and care for my loved one, but I need a bit of help. That’s really what you are asking for. Susan Eng: That’s right. Just a little hand here, that’s all it is. It’s those kinds of things that not only the actual dollars, of course, are meaningful, of course, but also a slow acknowledgment in the public domain that this is a public good. We are going to spend public tax dollars on doing this. So helping people look after loved ones, helping people save and manage for their own retirement; these are elements of public good and so too is a public pension. Doug Hoyes: That’s my conversation with Susan Eng, and I think there was a lot of food for thought in her comments. What role should government play in helping seniors? How much should we be responsible for ourselves? There are no easy answers, but CARP is doing what they can to help seniors both with more government help, and also with education programs to help seniors help themselves. That’s the podcast only bonus segment here on Debt Free in 30. I’ll be back next week with a brand new episode where we’ll switch gears and instead of talking about seniors, we’ll go to the other end of the age spectrum and talk about millennials. Thanks for listening. See you next week. Announcer: Thanks for listening to the podcast only bonus segment of Debt Free in 30. For more information on today’s show please go to hoyes.com, that’s h-o-y-e-s-dot-com, or type the word “podcast” into the search box for more information on every episode of Debt Free in 30. Until next week, this was Debt Free in 30.